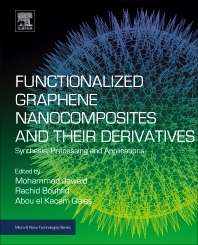 Functionalized Graphene Nanocomposites and Their Derivatives: Synthesis, Processing and Applications explains how the functionalization technique is used to create graphene nanocomposites, also exploring its current uses in industrial applications. Graphene-based nanocomposites are one of the major advancements in polymer-based materials, thus the synthesis, nanoscale dimensions, high aspect ratio, mechanical, electrical and thermal properties of graphene and its derivative have all been major areas of research in the last decade. This important reference covers these updates and is a critical book for those working in the fields of materials processing and characterization. Rachid Bouhfid is Senior Researcher, Moroccan Foundation for Advance Science, Innovation and Research, Morocco. His research is mainly in the field of organic synthesis of new amphiphilic molecules in order to use as modifier of inorganic fillers and the development of new polymeric nanocomposites based on clay and nanoclay, graphene and nanocellulose. Abou el kacem Qaiss is Director of polymer processing Laboratory, Institute of Nanomaterials and Nanotechnology (Nanotech), Rabat, Morocco. His area of research interests includes Hybrid Reinforced/Filled Polymer Composites, Advance Materials: Graphene/Nanoclay, Lignocellulosic Reinforced/Filled Polymer Composites, Modification and Treatment of Lignocellulosic Fibres, Nano Composites and Nanocellulose fibres, and Polymer blends.